DekTec has always been at the forefront of test modulators, starting with the DTA-107 satellite PCI modulator in 2004. Since then the portfolio has grown to an impressive line of modulators covering all DTV modulation standards in use around the world. 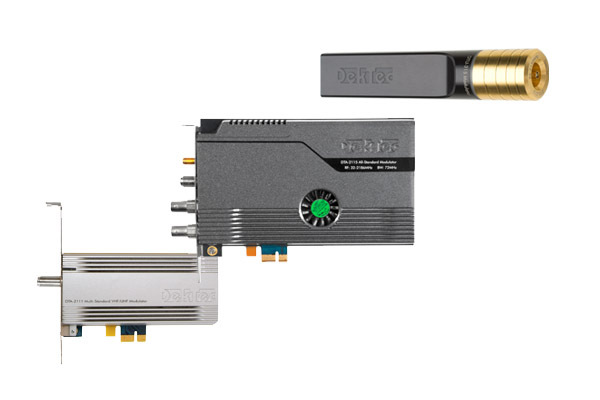 The modulator line was recently completed with two all-digital modulators, the DTA-2115B high-end test modulator for PCIe and the portable DTU-315 for USB-3, both summits of technology and design. Portable modulator for satellite, terrestrial and cable, all in a single device. The DTU-315 is bus-powered, so no power supply is required. A good fit for laptop or tablet, but convenient for use with desktop- and server PCs too. Portable, USB-powered modulator for terrestrial and cable standards. The DTU-315 is a fully-featured modulator with an attractive price, ideal for demonstrations and R&D. DekTec's PCI modulator for satellite, ready for direct generation of DVB-S or DVB-S2 signals. It has a programmable output level up to -27dBm (DVB-S) and support for a wide band, with symbol rates up to 45MBd. DekTec's PCIe modulator for most QAM-, OFDM- and VSB-based modulation standards. The DTA-115 has a programmable output level with perfect signal quality.